If you haven’t received our traditional holiday card (real card, printed on real paper), it is not because you have been particularly naughty or ridden your motorcycle too fast. It is simply because we haven’t sent any (yet). With Bill’s New Zealand work visa still in a bureaucratic limbo, we are currently celebrating the holidays on opposite sides of the planet. Because of the uncertainty in our current life, I simply didn’t know what to write on the card. Instead, you are getting this collage of holiday cards from 2009 through 2016. The photo in the middle is from our visit in New Zealand in 2014. 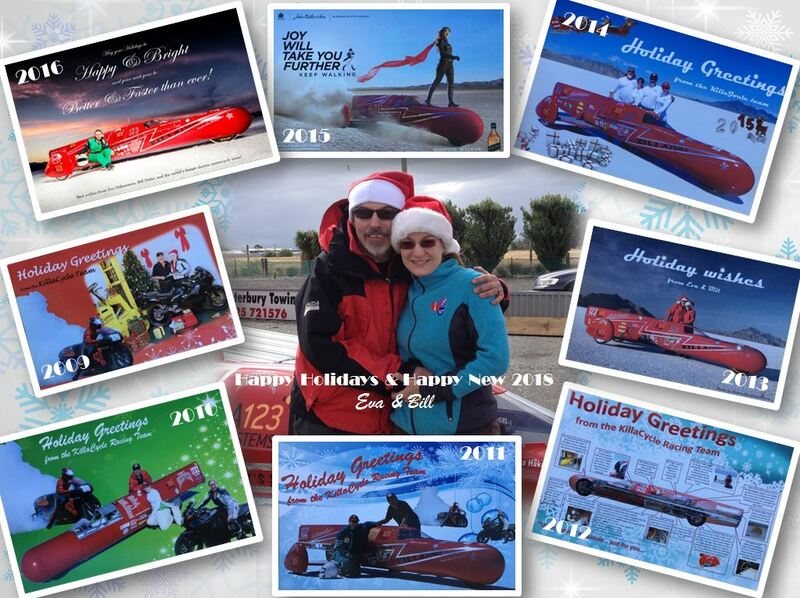 We want to say “Thank You” to our all supporters, sponsors, and volunteer crew member that have helped us throughout the year. Without you, the KillaJoule wouldn’t be the world’s fastest electric motorcycle. We are currently in the design phase of its successor – the Green Envy, with the goal of becoming the world’s fastest motorcycle. Period. We will keep you updated with the progress here. Happy Holidays & Happy New 2018! Let’s go even faster!